by Dr Wiebke Oellrich, Company Veterinarian, Aviagen Turkeys. 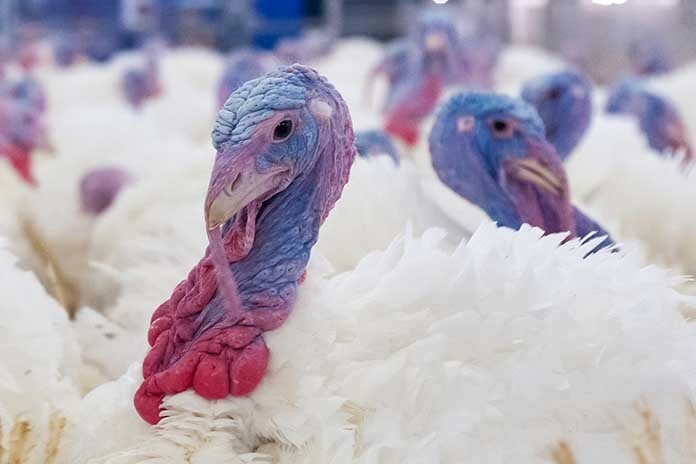 The production of turkeys without the use of antibiotics is an increasingly common goal across the globe due to the focus on antimicrobial resistance. For too long, the use of antibiotics has been seen as a quick and easy way for solving production or management related issues rather than tackling the underlying causes. The industry must aim at improving the conditions surrounding the birds to eliminate the need to use antibiotics. This can only be accomplished by investment in facilities and training, better management, and a fully integrated approach. In order to achieve this goal a number of important factors need to be addressed. These include breeder health, biosecurity, flock health, gut health, water quality and environmental management. Sourcing poults from appropriately vaccinated, healthy breeder flocks which have been fed on a well-balanced good quality feed is essential for them to have the potential to withstand the early challenges of the brooding period and to go on to develop a good, balanced intestinal flora which is essential to antibiotic free production. A strict biosecurity programme must be in place. This is necessary to safeguard the health of the turkeys by preventing the introduction and exposure to infectious disease causing agents like Mycoplasma. An effective programme requires identification of the most likely sources of disease and establishment of practices designed to prevent the introduction and the spread of these pathogens into and between flocks. Practices include ‘exclusion’ and ‘containment’. Exclusion applies for example to visitors, vehicles and equipment that visit other poultry or livestock farms as well as not sharing staff with other sides. Containment covers areas like isolating the houses, controlling rodents and insects, and the entry of wild birds and other animals to the house. Showering-in and farm-dedicated clothing should be the standard on site. It is worth noting that the downtime between flocks is equally crucial to good performance. In this regard it is more important how many days the turkey house is rested under dry and clean conditions after thorough cleaning and disinfection rather than how long the houses are empty. The time depends on the health challenges on the farm and the geographic location. Preventing coccidiosis and necrotic enteritis are usually the main concerns during antibiotic-free production. Litter management and stocking density play a part in this. The lack of availability of coccidiosis vaccines makes this difficult though. The use of a vaccination programme tailored for the location and situation of the flocks can prevent a range of viral and bacterial diseases. Where needed, the use of autogenous vaccines, which are specifically designed for the individual operation and usually aimed at bacterial infections, can be a good tool to minimize impact of the pathogens common on a farm. In turkeys, many factors affect gut health and consequently performance and susceptibility to infection. Good quality feed is essential for optimum digestibility. Anti-nutritional factors, including the physical form of the feed, impeded accessibility to feed due to high stocking density, nutrient content, and mycotoxins play a role in reducing gut health. Antibiotic-free production programmes need to place particular emphasis on avoiding levels of mycotoxins that exceed recommended limits. The risk levels can be elevated in many regions. Producers should be monitoring feed for mycotoxin contamination and, if necessary, implement a mycotoxin management programme. Grain damage and conditions that could increase mould and insect spoilage must be minimized. Fats and oils with rancidity should be rejected. Bacterial contamination of feed and/or water can damage the intestinal tract, leading to an inflammatory response within the intestine and a shorter transit time for the digesta in the gut. Nutrient availability is consequently reduced. Poor environmental control, particularly poor management of ventilation can result in wet litter and or chilling of the birds and subsequent gut health issues, which further exacerbate the poor litter conditions, as the outcome of reduced gut health can be diarrhoea. 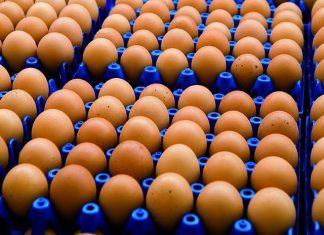 Diarrhoea can also lead to dirty eggs in laying flocks, which may result in a greater number of eggs being rejected or becoming infected. Wet litter is also known to lead to increased foot-pad lesions in turkeys. Water quality is often overlooked in turkey production systems even though it is a vital nutrient and can have a negative impact on the birds when containing harmful pathogens or generally high numbers of bacteria, yeast or moulds. Whilst feed quality often gets a lot of attention, it needs to be kept in mind that a turkey will consume about twice as much water during its lifetime as feed. Even if mains water of good quality is used, daily water line sanitation and regular drinker cleaning is required in addition to water line cleaning between flocks. This is because bacteria, fungi or yeasts can quickly re-establish a biofilm in the water system. Some additive products like vitamins or vaccines provided via the drinking water can also create conditions favourable for the growth of biofilms. Mortality is reduced and health greatly improved when this biofilm is removed. Ideally the build-up of a biofilm should be prevented right from the start after thorough cleaning of the water lines between flocks. A daily water sanitation programme will therefore benefit the birds and the water system. Utilisation of disinfectants approved for use in the drinking water of food animals reduces the level of water-borne pathogens. Various sanitation methods are in use. It needs to be kept in mind though that turkeys are sensitive to taste and can reduce water intake as a result. Good housing environmental conditions with low stocking density should be provided for effective antibiotic- free turkey production. Any bird not experiencing the right environmental conditions according to its age will be under stress and more susceptible to health challenges. During brooding for example, it is important to provide sufficient feeding and drinking space to avoid competition. Stress has a negative impact on the birds feed intake pattern which can affect intestinal motility, further impacting on gut health and disease resistance. Maintaining precise temperature control to avoid heat stress or chilling and providing the correct ventilationto take away harmful gases and humidity as well as providing oxygen is helping to make the bird comfortable and eat properly. Turkeys spend their life in close contact with litter material. The aim is to establish good, dry but dust free litter conditions to avoid problems like respiratory disease. High ammonium levels in the air lead to damage of the airway tissues and therefore increased susceptibility to infection. Having had the option to use antibiotics for many years has resulted in embedded practices that will need to change as the industry moves towards antibiotic-free production. Antibiotic-free production is not really adding anything new to the current systems, but it requires careful attention to detail and making sure that no areas are left to chance. Systems need to be tailored to specific operations, continually be reviewed and practices amended as necessary. Having a proactive rather than a reactive approach should lead to the desired result.